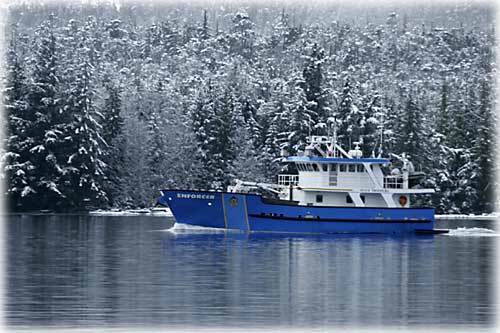 Ketchikan, Alaska - At a cost of $1.2 million, the Alaska State Troopers/Wildlife Enforcement's new 69.9 foot Patrol/Vessel Enforcer was commissioned into service in July 2005. She replaced the retired 65-foot P/V Enforcer which was built in 1953 for the United States Navy. The new P/V Enforcer is equipped with twin 3406 E 550-horse power Caterpillar engines and has a maximum speed of 11.3 knots. She also has two John Deere 6 cylinder 99 KW generators and carries 10,647 gallons of fuel giving it a range of 3,000 nautical miles or 13 days underway. The Enforcer carries a 17 foot NAIAD inflatable skiff to conduct vessel boardings and carries 350 gallons of gasoline for the patrol skiff, which provides another 2,180 miles of patrol coverage. She is equipped with the latest in navigational technology including a complement of marine radios, satellite phones, police radios, weather fax, e-mail system, RADAR, infrared detection camera and chart plotting system. The Enforcer has sleeping accommodations for eight persons. She has four staterooms that berth two personnel in each, two complete heads with showers and a washer/dryer compartment.